Losing your peripheral vision would be an unpleasant (and potentially unsafe) scenario -- but imagine how limited your eyesight would be if peripheral vision was all you had. An age-related disease called macular degeneration can actually create that nightmarish situation by damaging the part of your retina that processes images in your central visual field, interfering with your ability to read, watch TV, drive a car, or even see your loved one's faces clearly. Fortunately, even this serious disorder can be controlled through timely diagnosis and treatment -- and we're happy to provide those services here at Museum District Eye Center. Macular degeneration is named after a group of retinal cells called the macula. This section of the retina is tasked with turning incoming light into the images you normally see directly ahead of you. The condition is often called AMD, or age-related macular degeneration because it usually becomes an obvious problem after the age of 60. Even before that, however, the macula can experience permanent damage -- damage which may not present symptoms for quite some time, which is one reason you want to be scheduling those regular comprehensive eye exams. Macular degeneration may progress in two primary stages. The earlier stage, which most patients have, is called "dry" (non-neovascular) macular degeneration. In this stage, small deposits called drusen may be found on the macula, and vision impairment may be very subtle. The less common, more advanced stage is called "wet" (neovascular) macular degeneration. In this stage, abnormal blood vessels develop inside the eye, with their thin walls leaking blood into the macula and the normally-clear vitreous substance of the eye. The first essential step in dealing with macular degeneration is detecting it before it can progress too far without treatment. Retinal examination under pupil dilation can reveal drusen or abnormal blood vessel growth. 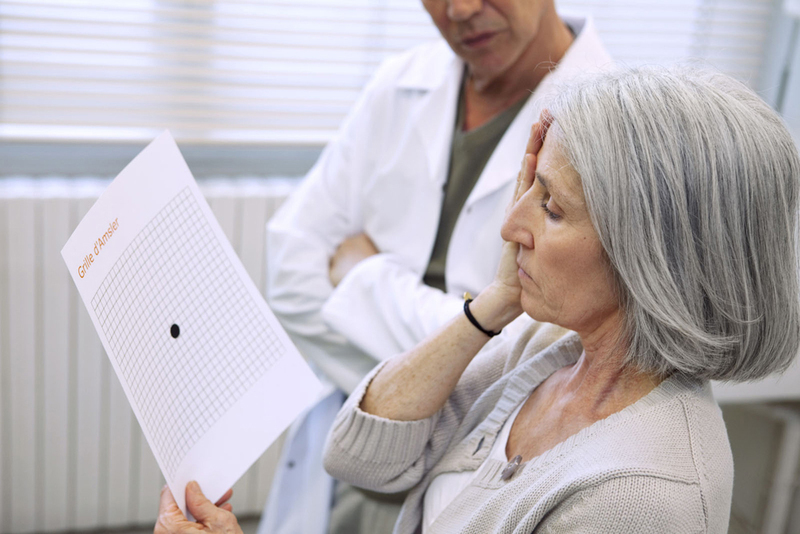 We can also use testing methods such as an Amseler Grid to see whether you're viewing straight lines as curved, another telltale sign of macular degeneration. Treatment of "dry" macular degeneration is mostly aimed at optimizing your lifestyle to minimize its development. Our ophthalmologist may recommend eating more antioxidants and fatty fish, as well as getting exercise and using eyewear that filters blue light (which may contribute to the disorder). "Wet" macular degeneration can be treated with injectable drugs that stop the growth of abnormal blood vessels. Our Houston eye doctor can also seal off leaky blood vessels or replace a blood-tinged vitreous in the eye. Take a proactive approach to getting your eyes checked for macular degeneration at Museum District Eye Center. (New patients may also want to take advantages of the 15 percent discount they'll receive on purchases at our optical center while they're there.) Call 713-333-0151 today for an appointment!